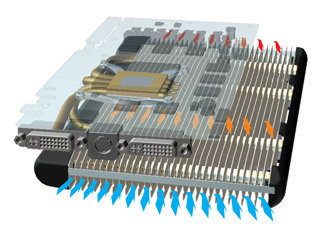 Are you a serious gaming enthusiast in need of passive cooling for your high-end graphics card? Well, fear not...because your search is officially over. The Accelero S1 Rev 2 VGA Cooler is here to provide you with the exceptional performance you need to keep your components at their maximum cool. Featuring 4 thick copper heatpipes that connect directly within an extra large surface area of the GPU core, the Accelero S1 effortlessly removes an incredible amount of heat from your graphics card. In fact, this noise-free VGA Cooler has such an elegant design that it's even outperformed many active cooling solutions. The heat from the GPU rapidly dissipates through 32 optimized fins that extend beyond the height of the graphic card, allowing for stronger, more effective air flow. It's easy to see why this incredible product from Artic Cooling is an industry leader.